[Stride]-Stride Step-[Choose one or more cards with the sum of their grades being 3 or greater from your hand, and discard them] Stride this card on your (VC) from face down. [AUTO](VC):[Counter Blast (1) & Choose a face down card from your G zone, and turn it face up] When this unit attacks, you may pay the cost. If you do, search your deck for up to two grade 2 or less normal units with the bloom ability and the same card names, and call them to separate (RC) on the front row and back row. Shuffle your deck. [CONT](VC) Generation Break 4:All of the rear-guards in your front row get [Power]+5000/[Critical]+1. Now this is a Bloom-based G Unit. Sadly, this only works to generate 1 more attack, but it’s an entire column’s worth of attacks and gives Critical when she’s on GB4 so payoff’s fair. New Diana and Kera proc Bloom by being called at the same time, and the called Kera can boost, or you can just bounce the front row Diana for guarding next turn when the turn ends. Those are generally the call targets you’ll be combo-ing this with, since the alternative is calling them to separate columns as well as separate rows: in other words, fixing a bad field. Not necessarily BAD as at least this won’t need anything already on the board to call things, and she has a use outside of anti-field wipe decks so at least you lose nothing by running her for either purpose. …please give me a better Denial Griffin. That’s all I can say. What’s up, Rogue Squad?! To wrap up our Plants Week, we’re going to have a look at the newest GR that Neo Nectar obtained: Velhemina. Vel (for shortening purposes) has a couple of neat tricks up her sleeve including extra attacks and even potential rear guards going critical, and the latter part makes a huge difference on how to guard. Normally, considering the potential smash of power that NN’s rear guards can accumulate, I’d usually recommend to let the rear-guard attacks hit if you’re at 4 damage or less and always block the Vanguard attacks. However, because of Vel’s GB4 skill, those rear-guards become an even bigger threat than before and might even have to consider blocking…even if they’re going in for over 100k (eat your heart out, Zoa). The only drawback I can think of is her first skill being restricted to just two Bloom units of the same name, but for most people, the easy target is going to be Kera or anything that can get a potentially giant power boost from seeing itself getting called. 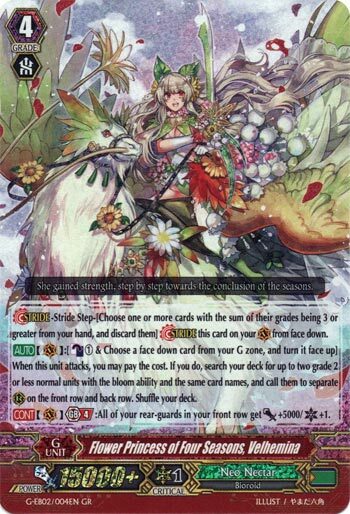 Overall, Vel is one of those cards where if you play Bloom, then you’re definitely playing her. Next Time: Space? Space?! SPAAAAAAAAAAAAAACE!!! !